Fourth stage of the Rally Dakar 2014 and a tricky day for the TEAM HRC riders who fought hard to finish in favourable positions ahead of tomorrow’s stage. Above all for Joan Barreda, who was able to overcome some complicated setbacks to finish in sixth position, but retains the overall standings. 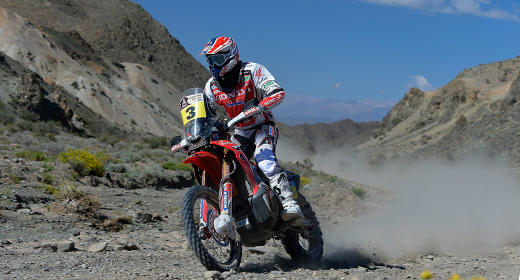 Joan Barreda continues at the head of the leader-board in the Rally Dakar 2014, albeit by a lesser margin after momentarily losing his way and conceding several minutes to his rivals before getting back onto the right route. The Spanish rider from Castellón continues to shine on the Honda CRF450 RALLY, registering another fine performance from the outset, that saw him crossing the Chilecito finish-line sixth on the day. The fourth stage started with a two-hour delay due to the difficulties inflicted upon the riders in the grueling outing of the previous day. Many bikes had lost their way, struggling to find the correct route until late into the night. Today’s second marathon leg to Chilecito, in the Argentine La Rioja region, similar to that of the previous day, was a mountainous affair with a lot of hard ground and rocks. Paulo Gonçalves was able to claw back several places, after having got lost on the previous excursion, and thus being forced to start from a long way back in today’s race. He finished in seventh position. Fellow Portuguese Hélder Rodrigues lost time to his opponents too, coming in ninth. Sam Sunderland suffered some problems during the liaison, where his engine stopped which forced him to drop out. The team is looking into what happened. Laia Sanz, the female rider being supported by Honda on the pre-production version of the Honda CRF450 Rally, once again put in a fine performance today, with a repeat of yesterday’s twenty-first position. Her team-mate from the Honda Argentina Rally Team, Pablo Rodriguez finished twenty-third. Joan Barreda: I was going well in the stage, until about 80 km from the end when I took a wrong turning after seeing a note at the river crossing. I’d spent a long time yesterday going over the roadbook which also indicated another way. I lost a lot of time. I went back to the same place, and then took the same wrong direction. I fell while I was trying to make up the lost time. But the good thing is that I’ve been able to salvage something out it… I lost a bit of time, but we continue to be ahead. Tomorrow is another day and we will try and rectify everything.